Rated 5 out of 5 by Quilter2005 from Excellent game Wish there were more like this... the sequels ranged from OK to Good. Love the clarity of the graphics in all of them (not the dark, brooding, indistinct graphics that have become the norm). The story line is great, and the puzzles are fun. 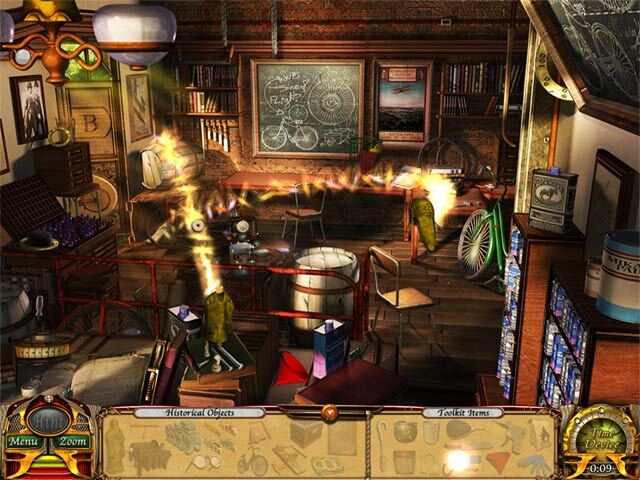 Rated 5 out of 5 by williamsdorothy6 from Exciting and informative "Hidden Object Game". 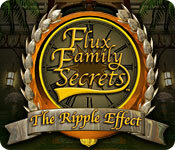 I enjoyed playing Flux Family Secrets: The Ripple Effect, It was very interesting with all the fun facts I learned concerning the characters of the time machine. I hope there are more games coming soon. Rated 5 out of 5 by superstar001 from Fantastic HOG Excellent game with really well done hidden object scenes. There are some puzzles, mainly easy but mostly HOS so this is a must play for all who enjoys good HOG. Also, graphics are cute, colorful with clear and sharp images. GREAT game, I would play it again! 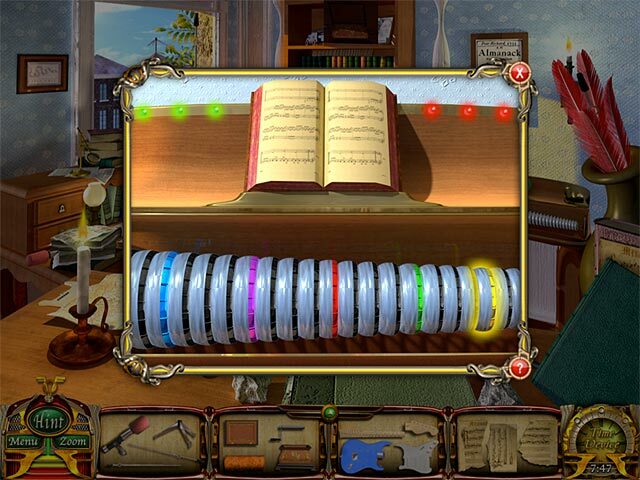 Rated 5 out of 5 by lindaye from Historical Fun This game presents historical events & facts in a fun and challenging hidden object and puzzle game. There is all sorts of puzzles to tickle the brain & test eye and hand coordination. Rated 5 out of 5 by rosekaufmann from Good Game, Partly Historical Storyline: Very well developed. Although the story is not entirely new, it is creatively presented to remain fresh. As Jesse, you’ll travel through time to find and replace some of the most important discoveries and treasures of some of history’s significant historical figures in 10 subjects such as literature, science, pioneers and music in various time periods. For each subject, 3 historical figures will need your help in recovering some of their important work. As a bonus, you’ll learn some interesting facts about each of the 10 characters. Artwork is gorgeous, colorful and very detailed. Instead of the traditional HOS, you’ll find parts of objects and place them in their proper places. An object completed for the first character may be used in the third characters location. But since you only get 3 locations per subject, there is very limited backtracking. You’ll also encounter a few circles into which objects must be placed. There is a built-in magnifying glass for the HOS to help find those “long skinny sticks." About half-way through, you’ll start looking for pieces of a “Delphi.” Not to spoil it, you’ll use the Delphi at the end. 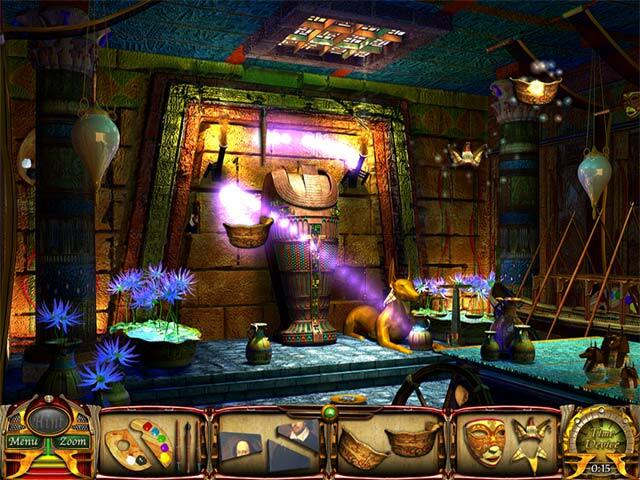 Each location has several puzzles and mini-games: a few were challenging but most were rather easy. The developers made an effort to try to give them a fresh look. A helpful hint system – it may hint what to do next or just show you where something is and recharges speedily. The game tracks your time playing. If you choose to skip a mini-game, 20 minutes will be added to your time. Fairly lengthy game - took me about 6 hours (which I think is close to what it took the first time I played it). Replayable since you’ll get different objects the 2nd time playing. Overall, the Flux family Secrets games are fun to play and this is the game that got me hooked. Rated 5 out of 5 by wahyukusuma from Pieces Games! I really love this game. people must play this piece game. Rated 5 out of 5 by joggle from Overall great quality fun The beauty of the game was in the following well thought out play: Though scenes got visited several times, making it a bit familiar to the player,but one got to see several different viewpoints of the scenes which made it not boring to look at. Some history was interwoven. It made for a good starting point of discussion. Mini games good but a bit similar in set up. Perhaps a bit more variety? Great mild fun without any scary or off putting scenes. Rated 5 out of 5 by bearlybrave from Pure fun I love this game. The graphics are beautiful, the sound and storyline are good. It is not overly difficult, but great pure fun. Every time I play I enjoy it. If you want to relax and just have fun this is the game. Check out the sequel, too. The CE has a fun bonus that really ties the 2 together. Can't wait for the next installment. I recommend this game.